TempSet Remote adds control of Simplex Temperature controllers to OMNIC Macros Basic. Temperatures are set and returned in Macros basic parameters so decisions can be made in macros such as to collect a sample at a temperature or to advance to a new temperature after a period of time. 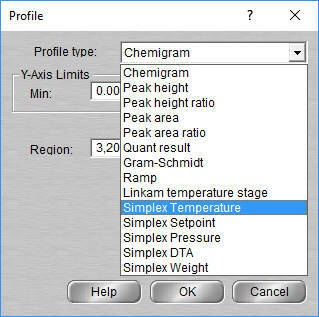 TempProfile provides temperature programming of Simplex Temperature controllers and control of OMNIC so allow collection of spectra at different temperature. 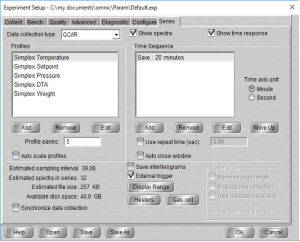 TempProfile works with OMNIC Series to capture the temperature data and display a curve live in data window and also is retained in the Series data file. A new series of functions add liquid handling to MACROS BASIC. Control Autosamplers, pumps and valves through the use of simple commands. Analysis in INTEGRA can be ported to a macro. RunSEQ command allows INTEGRA filling and cleaning files to be used. Simplex Accessories input data into OMNIC - Series for live viewing and improved analysis.